A message supposedly sent from Ubisoft to GameStop employees outs plans for Assassin's Creed III DLC. 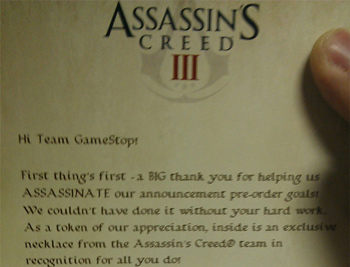 An unnamed tipster has photographed a note supposedly sent from Ubisoft to GameStop employees. The note thanks the employees for helping the Assassin's Creed III team "ASSASSINATE [their] announcement pre-order goals" - "assassinate" is in capital letters because it's a play on words, you see - before outlining the developer's plans for ACIII DLC. If the note is legit, Ubisoft is putting together a second, complementary development team to work on "post-launch episodic content" to continue the "Game of the Year experience that Assassin's Creed III will undoubtedly deliver." The Assassin's Creed series is no stranger to paid DLC, but most of it has been of the multiplayer variety. "Episodic content" seems to imply that the DLC will be suitable for players who enjoy stabbing Templars on their lonesome. There'll be a lot of it too, or at least enough to warrant sales of a "Season Pass" for the game. "We'd love your continued assistance in informing pre-order customers that a better value is available for those who pre-order Assassin's Creed with the 'Season Pass,'" the note continues. We'll get to see if that "game of the year" comment proves true when Assassin's Creed III launches on Xbox 360, PS3 and PC this October.